Don’t damage your lawn by parking recklessly! Here are the top three reasons why your grass might be getting damaged. By parking on the same grass, the tyres slowly but surely compact the soil. When the car is parked on the grass after it rains, eventually the soil will compact further down and ruts will form. The grass will not grow back in these areas, which leaves unsightly tyre tracks on your lawn. 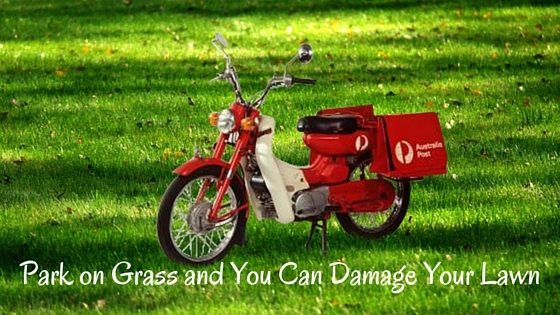 The postie’s motorbike takes the same course every single day, damaging and compacting your lawn. The grass will not grow and the ground can become unlevel and dangerous. If you want a grass finish and won’t be damaged by the posties, consider installing GR14 Grass reinforcement mesh on your lawn. 3. Chooks and Dogs digging up your lawn? TR4 Grass reinforcement mesh is easy to roll out on existing lawn and within weeks, you won’t even see it. TR4 will protect your lawns root zone from scratching chooks and digging dogs, leaving you with 100% grass cover. You can use your lawn for parking and let your animals roam free and still enjoy fantastic looking grass by using GR14 and TR4 grass reinforcement mesh. If you’re struggling with any of these lawn-damaging problems, consider our park on grass solutions. Our grass protection range features grass protection mesh, turf reinforcement mesh and permeable paving. To find out more or to place an order, talk to one of the friendly team members at All Stake Supply on 1300 130 123. We can help you select the best grass reinforcement product for your lawn. Visit our website for landscape supplies – delivered throughout Sydney. Which erosion control product is right for me?